Create a fair and supportive environment. Do you provide the tools and resources employees need to succeed? If people are failing or if there is turnover, the first place to look is at the supervisor in charge. Good supervisors cultivate good, highly efficient employees, but the reverse is true as well. People don’t leave jobs, they leave bosses! Watch turnover and connect the dots! Invest in your human resources! After a vigorous project or particularly stressful time, offer some time off. Gift cards — $5.00 to Starbucks goes a long way. Present them with a certificate of thanks. When performance improvement is required, be sure to communicate that PROMPTLY. DO NOT wait for the annual performance review and use it as a area of improvement. A performance review should be considered a recap of information already communicated and a review of the results. A good leader does not blindside an employee with a never-before-communicated laundry list of complaints at their annual review. Seek to counsel and to guide. Do not seek a “gotcha” moment! Value your team members. They are your most important investment. Make every effort to avoid shaming or embarrassing an employee when a difficult conversation is necessary. Speak to them privately about performance related issues. They are people with feelings. Remember, most people want to do a good job and be considered a good performer. Strive for equal treatment of all employees. Be careful to follow the same process in conversations and reviews with all employees. Singling out an employee for special treatment, good or bad, sends a signal to other employees. Avoid the perception of favoritism by being observant and perceptive of how your words and actions are being interpreted. Establish a culture of respect. Listen and work as a team to resolve issues. Do not jump to a conclusion after hearing one side of an argument. Communicate clearly and frequently expectations and how you measure success. Do your employees clearly understand your expectations? Is there a job description and if so, is it up to date? Do employees understand the organizational Mission and Values? Provide annual reviews and regular feedback in-between reviews so employees know where they stand. Don’t be invisible. Let people see you. Ask about them, their weekend, whatever you know interests them. What do you know about the people who report to you? How do you recognize milestones and accomplishments? Do you know anything that is important to that employee aside from work? Is the employee in need of support due to a difficult life experience? Strive to create meaningful work. Is the assigned work fulfilling – in any way? If not, what can you do to improve the situation? Ask the employees – Communicate! What improvements could make their job more rewarding? What about their job do they like and do not like? Work with employees to provide opportunities to do what they like and to improve their job if it is reasonable. 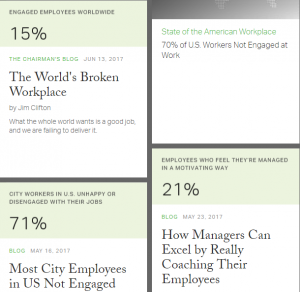 According to the June 13, 2017 Gallup Chairman’s Blog, 15% of employees worldwide are engaged in their jobs. A separate Gallup Poll reveals that 70% of employee motivation originates with the employee’s manager. Imagine if employees were motivated and engaged because of their manager? According to Gallup, motivated employees are 31% more productive which results in an increase in sales of 37 percent. Additionally, motivated employees are 87% less likely to quit than their demotivated counterparts. Turnover is one organizational expense that can be limited via support and training by skilled motivational leaders. In short, your leadership style has an impact on your organizational culture and environment. Take the time to better understand yourself so you can better support your teammates. Learning about yourself can be eye opening and life changing; and the risk is worth the reward. After all, it does take heat and pressure to create a diamond! Kyle White is an Extension Educator, Medina County & Western Reserve EERA. Posted in Leadership Development	Tagged employee satisfaction, motivational leadership	Bookmark the permalink. This is great material, Kyle! Thanks for the tips. I especially like #13 about creating meaningful work and communicating. Excellent article!